Before the first day of school this year, I learned that a student who was to attend our campus took her own life. She was 15. This would have been her 16th year. It should have been a shining time for her: a junior in high school, a driver’s license, maybe her first job, and if her family was like mine, her first date (I had to be 16). Her family, of course, is devastated. I didn’t even know this child, and I am devastated, as I am every single time I hear of the awful reality of suicide. I don’t know what, really. I do know that the world should be a hopeful place. I also know that so often adults refuse to act like it is. I am as guilty as the next guy of going through the motions, mirroring the depressive nature of my Bad Day. But I vow to stop. 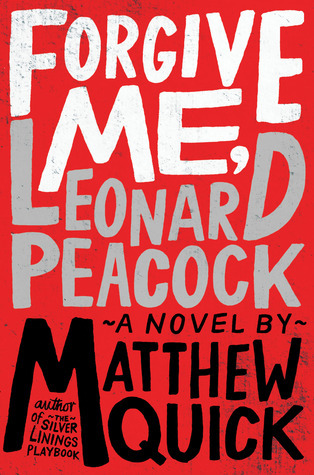 Recently, I read Matthew Quick’s book Forgive Me, Leonard Peacock, and it rocked my world. Seriously. You know when you read a book, and then it haunts you — like forever? This is one of those books for me. I am, and will be, a better teacher, friend, wife, mother, daughter, colleague, leader, consultant because I read this book. Here is a bit that I will use in class. Maybe we’ll use this passage for close reading. It’s a good one for tone or sentence structure. Maybe we’ll use it to launch a class discussion about hopes and dreams and how to hold on to them. I don’t know yet. But there’s something important here — for us and our students. Read it. You’ll see what I mean. Note: There are two footnotes in this passage. I left them off quite simply because I do not know how to format them in WordPress. Sorry, Mr. Quick.